Physico-chemical parameters such as temperature (37°C), pH (7.0), agitation (200 rpm), substrate (5 mM) and cell mass concentrations (200 kg/m 3) and reaction time (3 h) were found optimum to enhance the bioconversion. Maximum conversion (89%) of quinic acid to shikimic acid was achieved using the above optimized parameters. Shikimic acid was extracted from the reaction mixture by a pH-dependent method and maximum recovery (76%) was obtained with petroleum ether. Biotransformation of quinic acid to shikimic acid seems to be a better alternative over its fermentative production. 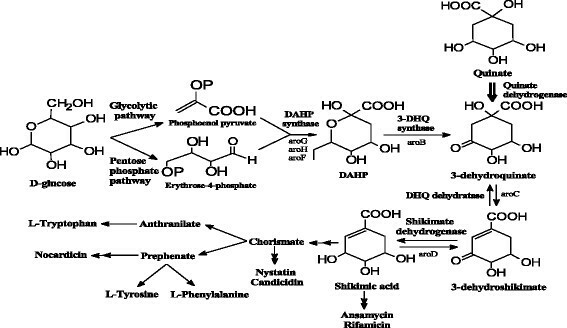 Shikimic acid, a key intermediate of the aromatic amino acid synthesis pathway  has immense pharmaceutical importance. This pathway is present in animals, plants and even in microorganisms as the common route for the synthesis of aromatic compounds –. Shikimic acid, a highly functionalized six-membered carbocyclic ring with three asymmetric centres, is a potent chiral building block for the synthesis of several biologically important compounds . Three aromatic amino acids, more than ten different antibiotics and many herbicides and pesticides have been synthesized from shikimic acid. The molecule has come under limelight in the recent years as it is an important precursor for the synthesis of Oseltamivir (Tamiflu), the only drug against avian flu caused by H5N1 virus ,. Synthesis of Tamiflu is solely dependent on the supply of shikimic acid. It is estimated that nearly two-thirds of the requirement of shikimic acid is still being sourced from plants, with the remaining one-third only obtained from genetically engineered Escherichia coli,. Several genetically modified strains have been used for over production of shikimic acid by fermentation, based on alteration in the central carbon metabolism –. Still, there is a need to develop cost-effective and better alternative method for shikimic acid production. Microbial biotransformation has been used for the production of shikimic acid from quinic acid in recent few years as a potent alternative of the available methods ,. The production of shikimic acid from quinic acid (1.4 mM) using Gluconobacter oxydans as biocatalyst has been reported , with both whole cell catalyst and immobilized cell system (57% to 77% bioconversion). In the biotransformation, quinate dehydrogenase (QDH), a classical membrane-bound quinoprotein containing pyrroloquinoline quinine (PQQ) as the coenzyme functions as the primary enzyme in quinate oxidation converting quinic acid to 3-dehydroquinate (3-DHQ) (Figure 1) ,. This 3-DHQ further gets converted to 3-dehydroshikimate (3-DHS) by 3-dehydroquinate dehydratase (DQD). Finally, 3-DHS gets converted to shikimic acid by the action of nicotinamide adenine dinucleotide phosphate (NADP)-dependent shikimate dehydrogenase (SKDH). Entry into the shikimate pathway from quinic acid seems to be advantageous over the classical pathway starting from glucose as there is less number of steps involved. From quinic acid, it is converted to shikimate by three enzymatic steps using microbial biotransformation . Bioconversion of dehydroshikimate (0.2 mM) to shikimate using purified shikimate dehydrogenase with 100% yield was also reported in literature . In this study, whole cells of Bacillus megaterium MTCC 428 were used as biocatalyst for the transformation of quinic acid to shikimic acid. Various physico-chemical parameters of the biochemical reaction were optimized to enhance the yield of shikimic acid. Metabolic map of shikimate pathway. Entrance to the shikimate pathway from quinate is indicated by a fat arrow ,. Quinic acid, shikimic acid and dehydroshikimic acid were obtained from Sigma Aldrich chemical company (Milawukee, WI, USA). Growth media components were purchased from Hi-Media Inc. (Mumbai, India). All other chemicals were of analytical grade. Bacillus megaterium MTCC 428 was obtained from Microbial Type Culture Collection, Institute of Microbial Technology, Chandigarh, India. The organism was cultured at 37°C in modified nutrient broth (NB) medium (pH 7.0) for 24 h. The media components were as follows (kg/m3): peptone 10, beef extract 1.5, yeast extract 1.5, and glucose 10. The strain was revived from glycerol stock and grown in a 20 mL medium and transferred (5%, v/v) to 100 mL production medium at 37°C (200 rpm) in an incubator shaker (Kuhner shaker, Germany). After 24 h, cells were harvested by centrifugation at 10,000 × g (Sigma 6 K15, GmbH, Germany). Cells were thoroughly washed with 100 mM phosphate buffer (pH 7.0), and resuspended in the same buffer with a cell concentration of 100 kg/m3 and used for the biotransformation reaction. Various physico-chemical parameters for the biotransformation of quinic acid to shikimic acid were optimized in 5 mL reaction mixture by varying one parameter at a time. Temperature was varied between 25°C to 45°C and pH values were adjusted between pH 4.0 to 9.0. An increased substrate concentration (2 to 20 mM) in the reaction mixture was used. The cell mass concentration was varied between 100 to 400 kg/m3. To optimize the cofactor recycling, different glucose concentrations (0.05 to 0.4 M) were used in the reaction mixture. The effect of reaction time on the yield of shikimic acid was observed by carrying out the reaction up to 6 h.
An analytical HPLC method was developed using high-performance liquid chromatography system (Shimadzu 10 AD VP, Kyoto, Japan). Shikimic acid was analyzed on an Alltech OA-2000 organic acid column (100 × 6.5 mm, 6.5 μm) (Grace Davison Discovery Science, Deerfield, IL, USA) using 2.5 mM H2SO4 as mobile phase at a flow rate of 0.3 mL/min and detected at 215 nm by UV detector. A standard curve of shikimic acid was made to quantify the biotransformation. Reaction mixture was analyzed by LC-MS (Model: LTQ-XL, Thermo Scientific, USA) to further confirm the product formation. Alltech OA-2000 organic acid column (100 × 6.5 mm, 6.5 μm) (Grace Davison Discovery Science, Deerfield, IL, USA) was used with 5 mM formic acid as mobile phase at a flow rate of 0.5 mL/min and detected by UV detector at 215 nm. Samples were analyzed in MALDI-TOF/TOF mass spectrometer (Bruker Ultraflex-TOF/TOF, Madison, WI, USA) for detecting the molecular mass of the product. After the reaction, sample was extracted by petroleum ether with pH adjustment and dried under vacuum. The dried sample was solubilized in methanol and used for the analysis. After the completion of the reaction, the mixture was extracted with petroleum ether by pH adjustment and dried under vacuum. The dried sample was solubilized in DMSO and 1H NMR and 13C NMR spectra were obtained with Bruker AVANCE 400 MHz (1H 400 and 13C 100 MHz). Chemical shifts were expressed in δ units relative to the tetramethylsilane (TMS) signal as an internal reference in DMSO. Being a highly polar compound, it is very hard to isolate shikimic acid from the reaction mixture by solvent extraction. Therefore, pH-dependent extraction method was selected where, at a particular pH, the compound gets deionized and it comes into the organic non-polar phase during solvent extraction. Before the extraction, the pH of the solution was adjusted to 4.48 and extracted with different solvents such as ethyl acetate, dichloromethane, n-butanol, petroleum ether, etc. Quinic acid is converted to shikimic acid by two enzymatic systems in Gluconobacter oxydans, as reported by Adachi et al. ,. Along with the classical shikimate pathway, starting from glucose, quinic acid can also be a potential entry point with the formation of 3-dehydroquinate by the enzyme quinate dehydrogenase. The reaction was carried out with quinic acid as the substrate and whole cells of B. megaterium as the catalyst. The reaction conditions were as follows: quinic acid, 2.5 mM; cell mass concentration, 100 kg/m3; temperature, 30°C; mixing rate 200 rpm. Under the un-optimized conditions 42% conversion of quinic acid to shikimic acid was obtained (Additional file 1: Figure 1-4 of Supporting Information). Various physico-chemical parameters for the biotransformation of quinic acid to shikimic acid using whole cells of B. megaterium were optimized. 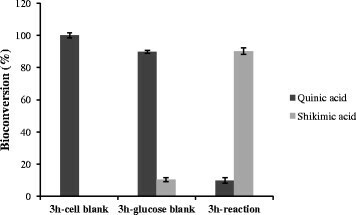 To determine the effect of reaction time, the reaction mixture (5 mL) containing whole cells of B. megaterium (200 kg/m3), quinic acid (5 mM), and glucose (5%) was incubated at 30°C (200 rpm). Samples were taken at 1 h interval upto 6 h. It is evident from Figure 2 that maximum conversion took place in 3 h while it decreased with the incubation time (Additional file 1: Figure 5 of Supporting Information). It might be due to the oxidation of shikimic acid to dehydroshikimate on long incubation. Hence, the subsequent experiments were carried out for 3 h only which is better than the previous reports of having 1.5 h as reaction time with 1.4 mM substrate  and 5 h as reaction time with 0.2 mM substrate . 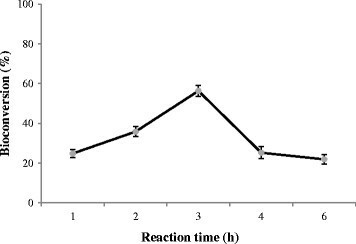 Effect of reaction time on transformation of quinic acid to shikimic acid by whole cells of B. megaterium . To investigate the effect of reaction temperature, the reaction mixtures as mentioned above were incubated at various temperatures (20°C to 45°C). It is evident from Figure 3 that percentage conversion increased with the increase of incubation temperature and maximum conversion was obtained at 37°C (Additional file 1: Figure 6 of Supporting Information). At higher temperature (45°C), the percentage conversion decreased. It might be due to the deactivation of the enzyme at higher temperature or oxidation of shikimic acid to dehydroshikimate by the reverse reaction. Biotransformation of quinic acid to shikimic acid by whole cells and pure enzyme was also reported in literature and in both the cases the reactions were carried out at 25°C ,. 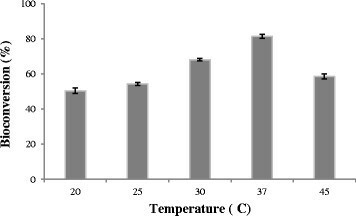 Effect of temperature on transformation of quinic acid to shikimic acid by whole cells of B. megaterium . To determine the effect of reaction pH, the reaction mixtures as mentioned above were incubated at 37°C having different initial pHs. The initial pHs of the reaction mixtures were adjusted between 4.0 to 9.0 using various buffers. It is evident from Figure 4 that percentage conversion increased with the increase in pH and maximum conversion was obtained at pH 7.0 which was similar to the previous reports , (Additional file 1: Figure 7 of Supporting Information). It was seen that at higher pH (7.5 to 9.0) there was a decrease in percentage conversion. It might be due to the oxidation of shikimic acid to dehydroshikimate by reverse reaction. 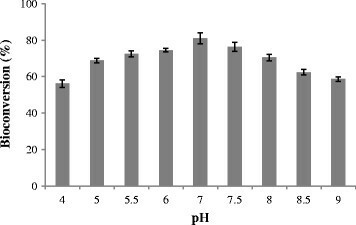 Effect of pH on transformation of quinic acid to shikimic acid by whole cells of B. megaterium . To determine the effect of substrate concentration, reactions were carried out with the increasing concentrations of quinic acid (2 to 20 mM). It is evident from Figure 5 that maximum conversion took place with 5 mM quinic acid and it decreased with the increasing substrate concentration (Additional file 1: Figure 8 of Supporting Information). The low conversion of quinic acid to shikimic acid at higher substrate concentration might be due to the substrate inhibition. In our case, biotransformation with the whole cells of B. megaterium, a maximum of 80% conversion with 5 mM quinic acid was obtained while 55% to 77% conversion with the whole cells of Gluconobacter oxydans with 1.4 mM substrate was reported by Adachi et al. . At higher substrate concentration (above 5 mM), quinate dehydrogenase, the foremost enzyme in the biotransformation pathway might be inhibited. 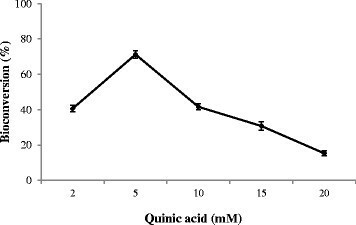 Effect of substrate concentration on transformation of quinic acid to shikimic acid by whole cells of B. megaterium . 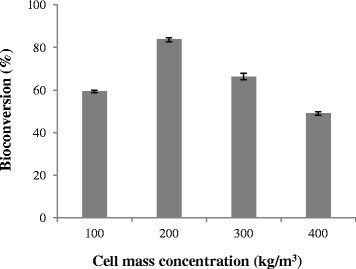 To determine the effect of cell mass (biocatalyst) concentration, reactions were carried out with increasing cell mass concentrations (100 to 400 kg/m3). It is seen from Figure 6 that maximum conversion was achieved with a cell mass concentration of 200 kg/m3 and decreased thereafter (Additional file 1: Figure 9 of Supporting Information). Higher viscosity of the reaction mixture at higher cell mass concentration might be responsible for the lower bioconversion. Here, 84% bioconversion was achieved with 200 kg/m3 cell mass at 3 h, while previous report mentioned a conversion of 57% to 77% at 20 h with 25 kg/m3 cell mass  (Additional file 1: Figure 11 of Supporting Information). Effect of cell mass concentration on transformation of quinic acid to shikimic acid by whole cells of B. megaterium . Cofactor recycling plays a key role in the NADPH-dependent enzyme biocatalysis; therefore, it is necessary to optimize the reaction condition for proper cofactor recycling ,. 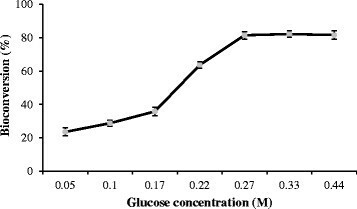 To study the effect of cofactor generation, different concentrations of glucose (0.05 to 0.4 M) were used in the reaction mixture. It is evident from Figure 7 that percentage conversion increased with increase in glucose concentration and maximum conversion (81%) was achieved with 0.3 M glucose (Additional file 1: Figure 10 of Supporting Information). The conversion remained more or less same with the further increase of glucose concentration in the reaction mixture. Under the optimized conditions (37°C, 200 rpm, pH 7.0) 89% conversion was achieved at 3 h (Figure 8) while 57% to 77% conversion was reported using whole cells of Gluconobacter oxydans by Adachi et al. (Additional file 1: Figure 11 of Supporting Information). Effect of glucose concentration on transformation of quinic acid to shikimic acid by whole cells of B. megaterium . The pH-dependent method was selected for the extraction of shikimic acid from the reaction mixture. After workup, the pH of the reaction mixture was adjusted to its pKa 4.48. Extraction was carried out using different solvents like ethyl acetate, n-butanol, petroleum ether and dichloromethane. Post extraction, the samples were concentrated on rotavapor and analyzed by HPLC. Maximum recovery (76%) of shikimic acid was obtained with petroleum ether (Table 1). The sample was then analyzed by matrix-assisted laser desorption/ionisation (MALDI) and nuclear magnetic resonance (NMR). After the completion of the reaction, product was extracted by pH-dependent method. The product was characterized as shikimic acid by 1H and 13C NMR and MALDI. Analytical data were as follows: 1H NMR (400 MHz, MeOD): δ 2.18 to 2.22 (days, 1H), 2.69 to 2.73 (days, 1H), 3.69 to 3.70 (days, 1H), 4.01 (s, 1H), 4.38 (s, 1H), 6.81 (s, 1H); 13C NMR (100 MHz, MeOD): δ 31.69, 67.35, 68.41, 72.78, 130.82, 138.81, 170.20; MALDI-TOF-TOF: m/z 197.32, 213.32 (Additional file 1: Figure 12-16 of Supporting Information). A potential biotransformation process is reported for the production of shikimic acid using whole cells of B. megaterium as biocatalyst. Various reaction parameters (reaction time, temperature, pH, substrate, biocatalyst concentration, etc.) were optimized. Maximum conversion (89%) was achieved under the optimized condition. Biotransformation of quinic acid to shikimic acid using purified enzymes are also reported; however, it has many limitations such as the use of co-factors (NADH/NAD+) in the reaction mixture and the quick denaturation of the enzyme during the course of reaction. Although a major advantage of mass transfer limitations are omitted in a cell-free system, due to inherent problems of enzyme denaturation, which makes this method difficult. The main limitation of transformation of quinic acid to shikimic acid is the use of higher substrate concentration. The enzyme titre may be increased by the well-developed techniques of recombinant DNA technology, directed evolution, etc. Shikimic acid production from quinate seems to be a better alternative over its fermentative production. One of the authors SG acknowledges the financial support by Indian Council of Medical Research, India. SG carried out experiments and data analysis during the study and drafted the manuscript. HP participated in the design of the study and performed experiments. OP conceived of the study and participated in designing experiments. UCB has been involved in drafting the manuscript and revising it critically for important intellectual content and also given final approval of the version to be published. All authors read and approved the final manuscript.